Rob Ventura Is an emerging artist who is best known for making contemporary gestural abstractions, including: paintings, ceramics, and drawings of various mediums. Ventura received his Masters of Fine Arts with honors from Boston University's Painting and Drawing program in 2013. 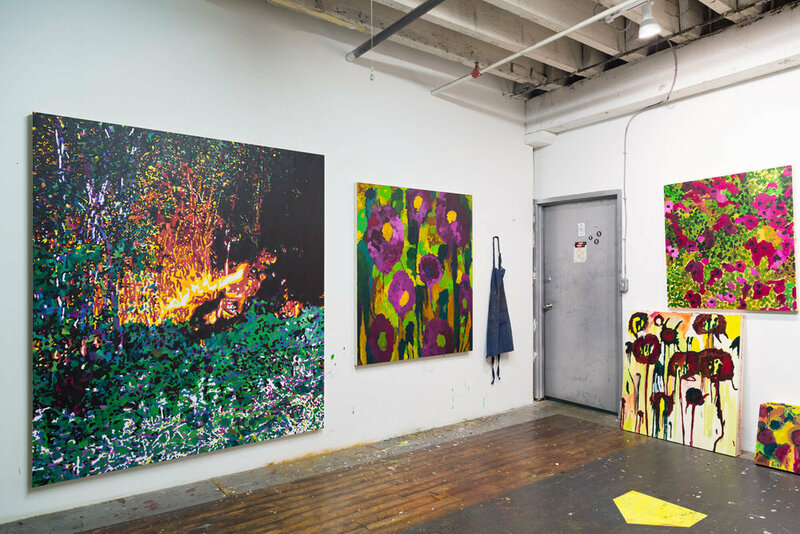 He has since exhibited in New York City at Signal Gallery, Freight + Volume, and SLA307; in Bellport, NY at Marquee Projects; and, in New Jersey at PROTO Gallery, Hoboken, as well as the Majestic Theatre, Jersey City. His works are included in the public collections of Boston University, Drew University, and Sovereign Bank. He has been covered by publications such as Cult Bytes, LVL3 Media, Gallery Gurls, HMAG, and Boston Art Underground. He is currently based in Hoboken, NJ. The Baptisia australis plant, commonly known as ‘false indigo’, is a poisonous flower found in North America. False indigo was formerly used by Native Americans and European settlers to dye clothes a deep purplish blue--to where it owes its nickname. The term reads as a double entendre in Ventura’s practice, referencing the application of translucent oil paints to create illusive chromatic colors. Rob Ventura is an emerging multimedia artist whose practice is concerned with contemporary approaches to painterly abstraction. His recent work, referred to as the False Indigo series, is a body of paintings, ceramics, and drawings depicting abstracted representations of poisonous flowers, as well as other references to the natural world. These floral arrangements evoke non-binary interpretations of pleasure and pain; seduction and destruction; organic matter and artificial concoction; love and narcissistic preoccupation; and, the creation of meaning and existential nihilism. Tim Daly was born and raised in Jersey City, New Jersey; his home and studio are in Hoboken. A realist painter, Tim is best known for his depictions of various sites within urban industrial landscapes of Hudson County and the Hackensack Meadowlands in light ranging from late afternoon through dusk, and into deep night. Born and raised in Jersey City, after having attended the School of Visual Arts in NYC, Daly began developing his distinct work, through inspiration drawn from mostly hidden landscapes in the New York and New Jersey. Collisions between mass industrialization and the natural world have been the basis of much of his paintings and drawings for the past three decades. According to Daly, “while landscape is the image, the real subject is the light, natural and artificial, and how it feels on and delineates these places. A certain tension is created, a psychological space where something else is happening unseen.” The poet James Ruggia has written, “On the surface, one is simply impressed with Daly's skill at rendering a believable reality. But, there is a vision at work, which makes these paintings seduce on a more mysterious level. An empty sheet takes on the mysterious quality of a deserted stage. The details have a ritual power.” Daly's work has received enthusiastic recognition with numerous exhibitions in New York and New Jersey galleries and museums, and is a four-time recipient of fellowship grants for painting from the New Jersey State Council on the Arts. In 2002, he was commissioned by NJ Transit to create thirty-two mural paintings for the Secaucus Transfer Station. His remarkable work is represented in many prestigious collections, including those of Coopers and Lybrand in Newark, Malcolm Forbes in NYC, Prudential Insurance Co. in Newark, Rutgers University in New Brunswick, and the writer Nick Tosches in NYC to name a few.